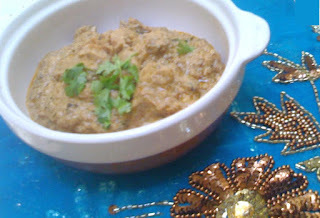 This is my first entry to the The Hyderabadi Ramadan Food Festival that Mona is hosting on her blog. This dish is made on a hot stone...so goes the name patthar ka gosht.Its a traditional recipe which is usually made rarely but believe me its very easy to make. Firstly heat a granide stone with charcoals underneath.you can also make it a cooker or vessel if u dont have the stone. Now heat oil together with desi ghee and add shazeera,whole garam masalas. Add ginger-garlic paste,greenchilli paste,kaju-khaskhas(or)badam paste,garam masala powder and whole black pepper(crushed a bit),pattar ka phool & salt. Add the mutton pieces and fry for 5-6 minutes. Add coriander and mint leaves and again fry for sometime. Add about half a liter of milk and pressure cook(for 10mins)/or cook on ur stone. Cover the lid and cook on low flame till the mutton becomes tender for approximately 1hour. Finally garnish this dish with coriander leaves. OMG ! this looks sooo yummyy !!! i want some !! looks very delicious , if possible can u post a pic of patthar ka phool so we know exactly what it is, we may be using it by other name or it may b a new ingredient, thanks ! Your recipe for Pathar ka Gosht sounds superb Anjam. Jazakallahu Khair for sharing! wonderful sounding recipe. Any particulars on the type of stone used? I tried "Pathar Ka Gosht" it is very delicious. For peope who want to know what the flower is, you can find black flowers in nahari ka masala packets. Based on Alaa Hazat's (Nizam's) tradition, I believe meat gets ooked between two stones. I tried this with placing the marinated meat pieces between two granite stones. The stones were placed inside a charcoal BBQ on the grill. The 'Pathar ka Gosht' turned out amazing soft and spicy with charcoal aroma. Everyone loved it. can we use pizza stone instead of granite ? Hi,ur information on this recipe is mindblowing, thanx for sharing recipe and knowledge. Asak lubna..im not aware of what a pizza tone looks like..anyways i also wanted everyone to knw tht u get granide utensils as well..for cooking..u can find thm at stone making or pot selling outlets..they r just the same like mud made utensils tht we usually prepare biryani in.. The trick is you need two stones and need to sandwich the meat between the two stones. Using 2 pizza-stones would also give you same affect but your cost shoots up. if you go to any stone shop and ask for 2 slabs of granite stones of good size e.g 12in x 12 in would be fine. Your cost would be negiligible. But remember the key is to have the meat pieces between 2 stones. i heard about your blog from Fatima.and i've just visited your blog.it's really nice. I tried this recipe n it turned out super delicious! This is a keeper! Thanks so much for sharing. When do v add red chilli powder?